New obsession: blouse-to-two part dresses! Thanks, Anthropologie! These are all over the place this and last season. 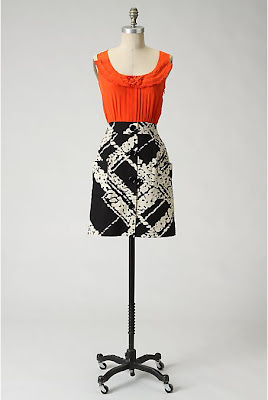 Nordstrom, Anthropologie... lots of combo two-part dresses that look like blouse/skirt outfits. My new obsession is taking unflattering blouses and converting them to cute dresses! Here's one that I just whipped together in an hour or so. I just got on a roll and raided my closet for icky blouses. I found a couple that I am planning on using for cute dresses, as the weather gets better! This started as a nice quality cotton gauzy, shapeless J.Jill blouse that I got at the Goodwill Outlet for $1.39/lb. So, like 25 cents. There are darts, but it's still loose and shapeless. It had 3/4 length sleeves, an open neck, and some cross-stitch details at the ends of the (wimpy) darts. I used a yard of cute black and white cotton and this darling vintage pattern. I didn't have enough fabric to do the buttons. (View C, the yellow one, without the buttons). I had to take in the side seams, too. Then I added the faux yoke at the front in the neckline (all made from the bottom 5" of the shirt, which I had cut off) and made a little rosette from the sleeve scraps!! What a transformation! It looks fabulous!! Fantastic. I love the idea of refashioning old stuff into new and you do it with flair! What a great idea! I love watching you create! Stop by and visit me sometime! I like yours better than the Anthropologie one! WAAAAAY better than the the storebought version! I love what you've done here, but I've got some sleeve questions. I'm a very very newbie sewer and am having problems figuring out how to keep my sleeves together. How do you figure out where to cut off sleeves in order to make a sleeveless top? And do you just fold under and sew the armhole seam there? Plus, when you take in side seams, especially if you're keeping sleeves, how do you sew the armhole without making it a baggy mess? Sorry, I just realized how technical this would be as a comment. Gah. Great questions! It all depends on the shirt... if you like where the sleeve seam falls on your shoulder, the easiest is probably to cut off the sleeve about 3/4" from the seam and turn it under using the existing seam allowance to anchor your little tiny hem. You may have to snip a couple places especially in the underarm to make it fit onto the seam allowance. Does that make sense? If you want to take in the sideseams, you pretty much either have to taper to the armhole or cut off the armhole seam allowance. If you're cutting off the sleeves anyway, do cut off the seam allowance as well and take in the side seams as much as you want. Try it on, and see if you need to trim away more of the armhole area to fit comfortably (sometimes if can be too wide and dig into your armpits). Then hem the armhole (or, better yet give it a bias binding with the fabric left over from your sleeves or other pieces you cut off! LOVE it! So very inspiring. Is there a back or side zipper in there? I'd love to see more detail of your yoke. Now I will go ahead and start buying those big shapeless tops at the thrift! i know this is an older post, but WOW! i love this look. i also love how ya do it for cheap at goodwill. im a HUGE fan myself. im also a fan of your blog and will be following! What a great transformation! It looks fabulous!